I recently wrote about the NYT best-selling novel that I stopped reading because the author had used the r-word (retarded) in the book, published this year. I had a big long rant on my own little blog and when I published the post felt very pleased with myself. After a few days I realized I was still mad. It’s like when someone says something that you disagree with and instead of speaking up, you walk away and think about all the things you wish you had said out loud. So I decided to tweet the author and let her know that I was affected by her choice of words and send her the post. My tweet didn’t ask much: I really loved Who Do You Love…until I hit the R-word. Please reconsider using it in future. I attached the blog post and figured that would be that. At least I went right to the source and let her know how I felt. To my surprise, not only did she tweet back, she tweeted out the passage in the book (which takes place in 1993) and asked her twitter followers if they felt she had done anything wrong. My response to her was simple. The word IS an insult (and it was then too). I’m not the only one who thinks so – sending her to R-word.org and that she could be true to her character without that word, siting John Green’s apology for using the r-word in Paper Towns. After the trolls went on for a while, other people who agreed with me started to join the conversation. Siblings, friends and other parents of individuals with intellectual disabilities jumped in with their take on why a writer in 2015 shouldn’t use the word – even in the context of 1993. 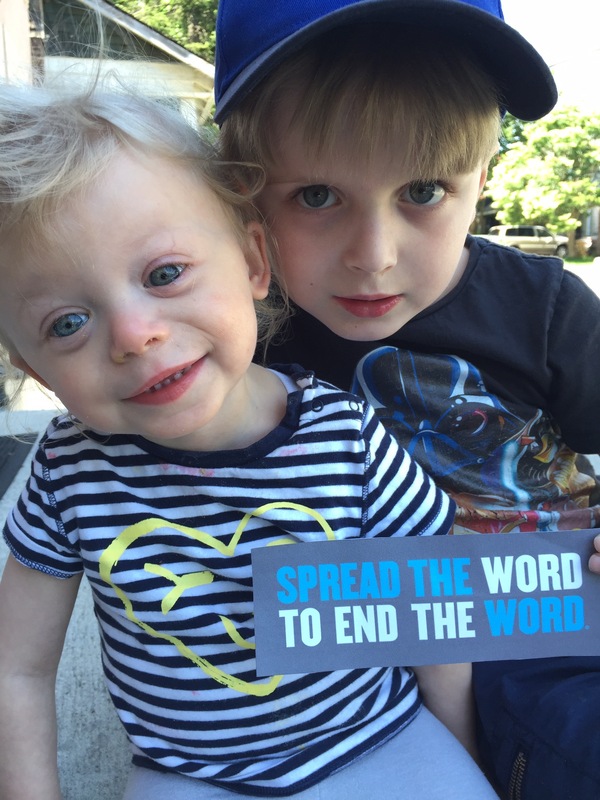 They cited experiences, blog posts and videos they had created to help End the Word. It was very inspiring. That one little tweet could rally such a thoughtful and heartfelt response made me glad I spoke up despite all the mean tweets that were scrolling by. She could re-write to remove the word. She could be true to character and rewrite to remove the word. I cried. That one little tweet could rally the whole community and a best selling author. Thank you. Thank you for responding, thank you for listening and thank you for understanding that the words we all choose can make a difference. When people use the r-word, it reinforces the stereotype that kids like mine won’t amount to much. It tells a teacher there’s no point in trying to teach her things – they must be beyond her grasp, and it tells a future potential employer that there’s no way she could do the job. It tells my son his sister isn’t worth much to the world and it tells her she doesn’t matter. Thank you for making her, and every individual with an intellectual disability matter – to you, to your readers. It’s just a couple of words to you, but to me, it’s a brighter future for my kid. It’s everything. Oh, and now I can’t wait to finish the book. So thanks for that, too. I’ve always known you can’t change the world by keeping quiet. But I’ve learned you don’t necessarily need a megaphone to do it. Sometimes 140 characters, a little passion and a little help from other people who believe in the same world that you do is enough. This is awesome! Way to go! Oh yeah, and the trolls can go f themselves with a splintery log. Good to see that one voice can light the way for others! Wish I could remember the quote put on an overhead screen at a Downs Syndrome Conference in 1994 referring to those small brained, lesser humans, etc., etc. and it was talking about WOMEN! Most people only care if it’s relative to them or their child, BUT it may be their grandchild! Courageous people blaze trails for OTHERS too!